Designed for use with 60w amplifiers and lower. This attenuator has a main volume knob and 3-position treble compensation switch which affect the signal to the speaker. It also has a 3-band tone stack and volume control for the line out signal only. Impedance selector for 2, 4, 8, 16 ohms, 0, 3db, and 6db treble boost, MASS bypass switch, unbalanced line out, tone stack for line out, tone stack bypass, extra output jack, range switch. The MASS employs an actual speaker motor for the load to yield a realistic interaction between the attenuator and the output circuit of the amp. The attenuation is continuously adjustable from -3dB to over -70db using the speaker control and the range switch. By turning the speaker control to minimum (maximum attenuation), the unit may be used as a dummy load for testing or for DI use. Optional wings may be employed for rackmounting the MASS (sold separately). The MASS occupies two rack spaces and requires adequate ventilation for proper operation. Want to record your Tube amp direct for your dream tone? This product these people have crafted, is hands down, without a doubt, one of the BEST pieces of gear I own. With the Weber Mass, my tube head, and an ADA GCS-2 cab sim/di, I have achieved the guitar sound I have always sought after and dreamed about. I'm not sure if tears of joy were streaming but I'm pretty darn sure it was close. I've been experimenting and recording with this setup and it's just face-melting. 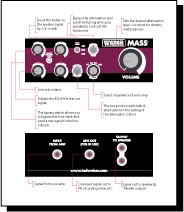 I'm worried the Weber Mass has just gateway-drugged me into going amp head crazy (already got my eye on a fender head). I can NOT heap enough praise onto this product. The people at Ted Weber should be commended and praised! Also, the build quality of this thing is insane! AND all the tone shaping features on it; amazing. I am going to be BURIED with this thing. The people at Ted Weber seriously need to infiltrate all the Guitar Centers and Sweetwaters of the world and show them how it's done. They've made an advocate for their products out of me and I'm just 110% satisfied. Just jaw-dropped! Also the price compared to the value is ridiculously economical! If this thing was stolen I would buy a replacement immediately without hesitation. I also have to mention the tech support of a Mr. C.J. Sutton; I had a bunch of question and he answered them all for me EXTREMELY quick. Amazing tech. support (Seriously it was like an email reply within half an hour or less). I have to say, after starting out and spending years recording guitars with Line6s/Zooms/Bosses/Guitar Rigs/Amplitubes and other amp modelers, I am NEVER going back thanks to tube amps and the Ted Weber Mass. EVER. Also, check out this review of the Mass. Amazing, hilarious, and cracks me up every time!